Don Williams of Chanel 4 TV News filmed a live interview of Jordan in her studio . They also filmed her visual and performing art show at Cinecitta to commemorate John Lennons birthday. John Lennon's portrait "Strawberry Fields" was on show for that entire year. This coverage brought a number of psychic imprssionist celebrity portrait commissions. Jordan along with her art has been touted on TV, newspapers, magazines, and even in the famous Cindy Adams column as well as many ART Publications. Zeigler Gallery - Zurich Switz. Shagreen Gallery - Savage Mill, Md. All art on this site is covered by copyright. Art created by the well known celebrity psychic artist Jordan. There are a total of 350 paintings available for shows and for sale in the current collection. 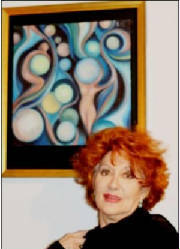 You can select a painting from her collection or comission one to suit your particular needs.